ONE – Tom Ford Sunglasses. TWO – Silk Gucci Scarf. THREE – Tan Cashmere Wrap. FOUR – Silk Eye Mask. FIVE – Noise Canceling Headphones. SIX – Volume Mascara. SEVEN – SPF CC Cream. EIGHT – Tinted Lip Balm. NINE – Cashmere Duster Cardigan. TEN – White V-Neck Tee. ELEVEN – “Party Girls Die In Pearls”. TWELVE – ‘Instasculpt’ Skinny Jeans. THIRTEEN – Leather Tote. FOURTEEN – Soft-Sided Duffel. FIFTEEN – Colgate Wisps. SIXTEEN – Mini Vanilla Deodorant. SEVENTEEN –Sanitizing Wipes. EIGHTEEN – Leather Sneakers. I remember traveling with my mother as a little girl and noticing how she always looked so put together and polished. She would twist her hair up and wear one of her pretty scarves and she looked so elegant and beautiful. She continues to wear some of those same styles to this day and they still work because they’re classics. I’ve definitely taken note and have implemented some of her tricks into my own travel style with a few new updates and a few tricks to help you feel your best no matter how long you’re up in the air. There’s something about these dirty little boxes of air that can make anyone feel exceptionally slimy, even after just a couple of hours. But there are a few essentials I’ve learned to bring with me that help me feel fresh and clean during travel. Upon arrival, I usually feel fresh enough to explore the city a bit or grab a bite to eat before heading to the hotel. Let’s be honest, those “in-flight skincare routines” we see influencers post are for business and first class flights only. When you’re sitting in economy, you’re lucky if you can raise your elbows three inches without bumping the person next to you. If you are sitting in business or first, bring some makeup wipes and eye gel pads, but my best advice is to check in for your flight looking and feeling your best and simply try to preserve it until you can get ready again at your hotel. When I travel I try to wear very little makeup. I make do with my favorite CC cream, a little mascara, and some tinted lip balm. I don’t go completely makeup-free because it makes me feel greasy and sloppy, but lots of makeup doesn’t usually look so pretty upon arrival. Most airlines offer a toothbrush and toothpaste even in economy class, and if not, a pack of Colgate Wisps can do the trick. I always bring a mini deodorant and a little travel sample of perfume to keep feeling fresh. I take them into the bathroom once or twice during my flight and freshen up so I don’t disturb other passengers by spritzing my perfume everywhere. I never forget antibacterial wipes for wiping down the surfaces around my seat; planes are dirty places and when I do this step first thing on a flight I instantly feel better. I also use the wipes to wipe down my tech items like my phone, iPad, and laptop at the end of the flight before I put them back into my bag. 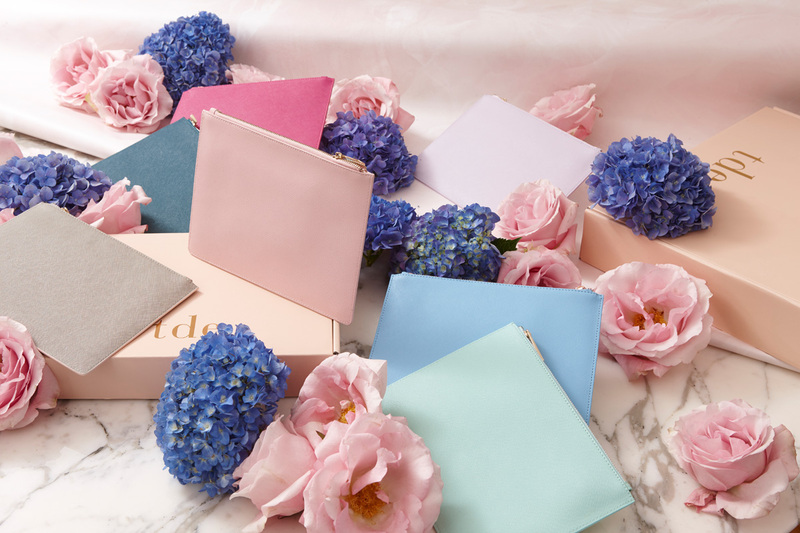 And they’re nice to carry in your bag while you’re out and about exploring each day. I’m sure you see the same people at the airport I do; they’re wearing their pajamas and they have piles of travel pillows and blankets with them. Don’t be this person. It looks tacky and it’s completely unnecessary, plus you’re really going to annoy whoever you sit next to with that load of bedding. (Trust me – my husband owns one and I want to bop him with it every time he brings it on a flight.) I promise, the airline will give you a decent pillow and blanket if you need one. And it’s just as clean as that pillow you’ve drug through seven airports. By layering your outfit, you can stay comfortable in fluctuating cabin temps and avoid looking like a mess. 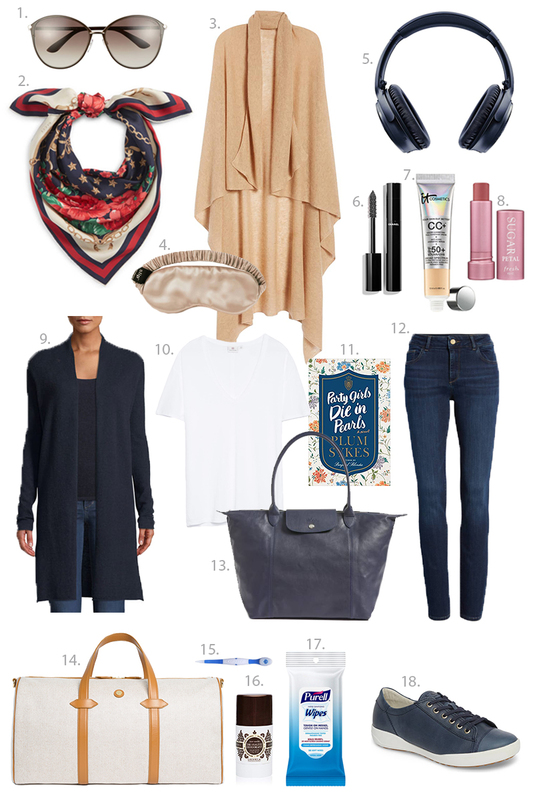 My go-to travel outfit consists of a chic cashmere cardigan, crisp white cotton tee, and simple dark skinny jeans. If it’s winter I will switch the tee out for a white blouse and add a classic trench on top. I always bring a colorful silk scarf with me when I travel. It pulls any outfit together and can easily give a daytime look just enough polish to head to dinner or drinks. Tie it around your neck, drape it over your shoulders, or tie it in your hair or onto a bag… The options are endless. Now that I’ve found these incredibly comfortable leather sneakers I want them in every single color. They are the only shoes that I can wear for hours on end comfortably. A little tip: start off wearing socks and when you get through security, stow them away and put your sneakers on with (clean) bare feet. The other pair of shoes I love for travel? Tod’s driving loafers. They’ll last you for years and literally mold to fit your foot. But break them in for a day or two before traveling in them. Don’t forget some classic sunnies to put on post-flight. Forget the trendy tiny sunnies out right now; the larger classic styles cover any hint of jet lag or puffy, sleepy eyes. I prefer a soft-sided duffel when traveling internationally. It can squish into the overhead bin nicely and is rarely forced to be gate checked. I usually bring a tote bag as my personal item and bag for daytime looks during my trip, then stash a smaller clutch or bag inside to carry in the evenings. This system forces me to pack a bit lighter than I normally would and I don’t risk losing important things by constantly switching bags throughout my trip. I’m sure you’ve heard about noise-canceling headphones before, but they’re so great I think they’re worth mentioning here. They block out sound – whether it be crying babies or airplane noise – and this pair feels incredibly comfortable to wear. This silk sleep mask is really just about personal preference. My eyes get so dry on planes and a few eye drops followed by sleeping in one of these masks seems to help. It’s not essential for everyone, but if you have dry eyes or are a light sleeper, you might want to try it. The silk isn’t just to be glamorous – it won’t give you face creases like other materials will. I always pack an oversized wrap or pashmina in my duffel bag. During the flight when the cabin gets cold, I pull it out and bundle it around my neck. Sometimes I cover my face with it when I want to sleep. I’m old-fashioned. I like a nice book in my hands. (Read about my current book list here.) I’ll load a couple favorite movies on my iPad pre-flight, but when it comes to books I have to read the paper kind. Leave a little extra time before your flight so you can check out the airport book store and browse the stacks. This is the most important part. Pack a clean tee or shirt and undies to change into in the airport when you arrive. Best case scenario, you’ll feel fresh. Worst case scenario, you’ll have essentials if your luggage is lost.